The Rivergate Tower is a 454ft (138m) tall skyscraper in Tampa, Florida and is the sixth tallest building in Tampa, currently leased by Sykes Enterprises. Because of its cylindrical shape, it is often referred to as the Beer Can Building by local residents. It was constructed from 1986 to 1988 and has 32 floors. Designer Harry Wolf based its measurements on the Fibonacci series. The building was originally known as NCNB Plaza and was the state headquarters of NCNB Ba. SkyPoint is a 361ft (110m) high rise in Tampa, Florida. It was constructed from 2005 to 2007 ad has 32 floors. Preston Partnership, LLC designed the building, which is the 9th tallest building in Tampa. It has 381 units and 10,500 square feet (980 m) of retail space. William “Wild Bill” Stroup BASE jumped off the building on March 6, 2007. 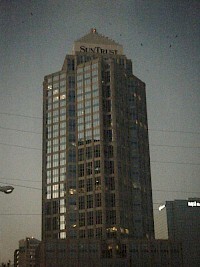 The SunTrust Financial Centre is a 525ft (160m) skyscraper in Tampa, Florida. It was completed in 1992 and has 36 floors. 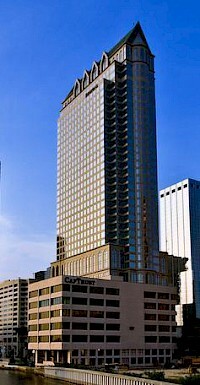 Cooper Carry designed the building, which is the 4th tallest in Tampa. It was designed to take a 110 mph wind load. Tampa Marriott Waterside is a 326ft (99m) high rise hotel in Tampa, Florida. It was completed in 2000 and has 27 floors. The building also includes 750 units and 50,000 square feet (4,600 m) of meeting space. It is the citys largest hotel and the 12th tallest in Tampa. The Stovall is a 255 ft (78 m) tall high rise in Tampa, Florida. It was completed in 2001 and has 22 floors. J. Scott Architecture designed the building, which is the 17th tallest in Tampa.